Michael Winterbottom from Church Building spoke to Marcus Cornish about his background and career as a sculptor. 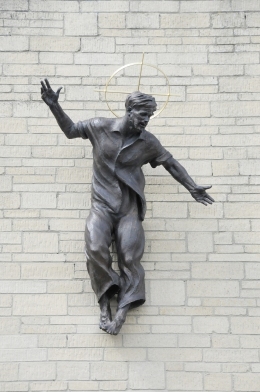 He told Church Building that in his 20 year career he had not, until last year, had the chance to make sculptures for churches, he went on to say, "as someone relatively recently baptised, this has been tremendously significant for me. I have seen the sculptures that I have made as being part of my education as a new Christian and a way of expressing my own faith. I want the sculptures to inspire and communicate in very human terms, by reaching out and also being relevant to both the congregation and the local community." "With all my sculptures, I have gone back to the fundamentals of the character or story being sculpted and let the notions involved move me and inform every aspect of the piece. Therefore the composition and modelling are as expressive as possible of the ideas involved and I also endeavour to use the architecture too."